Our Products >> Hold It, Buster! 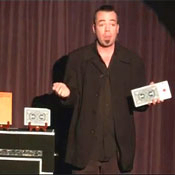 This versatile routine works great in virtually any venue from Kids to Corporate to Comedy Clubs! It's a funny, pun-filled monte routine complete with Harlan's professional script motivating the actions, increasing each magical moment, and eliminating the "sucker" aspect. Each phase gets more amazing, leading up to a surprise finish. Comes Complete with the Jumbo Cards, Envelope, and Fully-Illustrated Written Instructions.